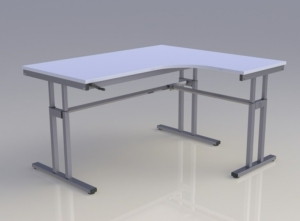 Our manually height adjustable desks offer an economic option to offices that want the flexibility of a height adjustable desk - but don't have the budget to stretch to the electric desks. Our range of manually height adjustable desks include the Mod-V desks which are set to a certain height to suit individual height requirements, Mod-C desks which are crank adjustable desks Our Mod-V & Mod-C height adjustable desk solutions are available in a range of desktop shapes, sizes and finishes or can also be supplied with the frame only - for re-using an existing top. The Mod-V height adjustable desks are not sit-stand desks as all items must be removed from the desk top before adjusting. They are pre-set height adjustable desks, meaning that they can be set to the correct height for any individual - avoiding their desk being too high or low. If someone's desk is too low, it can cause them to hunch over to use their keyboard and mouse. Similarly, if the desk is too high, it can can cause users to stretch. The Mod-V manually height adjustable desks allow for all individuals to have their desk adjusted and set to the correct height for their needs, ensuring a correct posture is maintained when seated. The lack of a crossbeam also makes them ideal for individuals requiring a leg rest or pedestal. 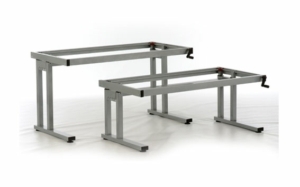 These are crank height adjustable desks which are easily adjusted by the manual turning of the crank handle. 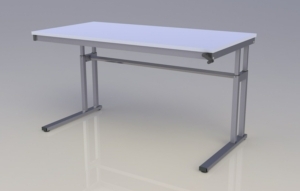 They offer a great height adjustable desk option for environments where mains sockets are unavailable or in schools where electric could cause a health and safety risk. 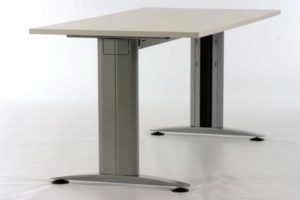 Please note - for environments where mains sockets are unavailable, we can also supply battery packs on certain models within our electric height adjustable desk range.